So, I promised that I’d give you a list of my favourite plants for attracting bees. This isn’t an exhaustive list by any means, but I’ve chosen plants that I really like, so not only the bees benefit! Bees prefer a relatively sheltered space, with sunshine. We’ve successfully grown a wildflower mix on the allotment and I’ve also decided to replant the small raised bed I have in the front garden with bee-friendly plants too. 1 – It’s useful to have a variety of plants with different flowering seasons throughout the year, giving a longer period to support the bees. 2 – Local native flowers are better, which seems quite obvious really, as they share natural habitat. You don’t have to solely plant native species, but consider including them in your garden. Make sure that you get any native species from an approved supplier instead of collecting from the wild, obviously. 3 – Single flower varieties of cultivated plants are better than fancier double-flowered varieties. Lovely bee! Image from the super talented Abi Manifold. My Favourite Plants for Bees – these are plants that I’ll be including in my planting either at home or on the allotment. 2 – Sunflower – Any variety of Helianthus annus will be great. After this summer’s success, we’re definitely planting these on the allotment again. 3 – Hellebore – Helleborus argutifolius or really any other type. I love Hellebores, they’re gorgeous plants that hide away often unnoticed in the garden. They’re perennials, so they don’t have to be replaced each year, and they’re in flower before almost anything else – which helps the pollinators in the colder months. 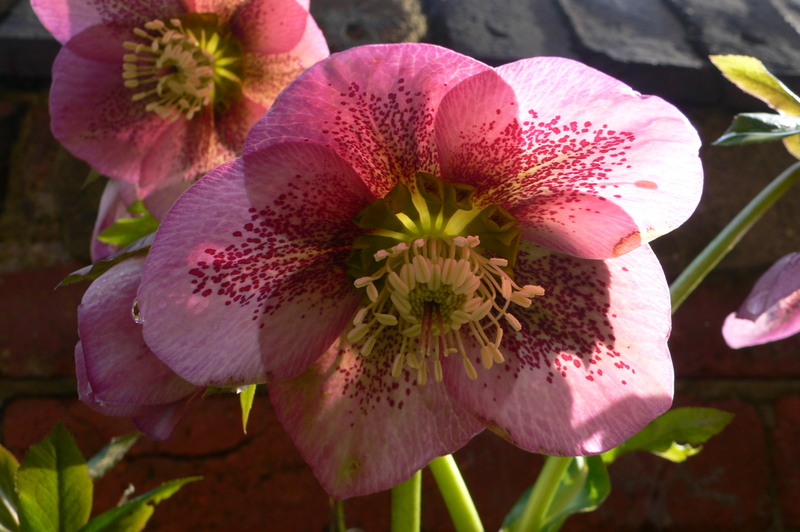 Other early flowers include crocus and single varieties of snowdrop, which are also lovely – but look at my Hellebore! Hellebore in my front garden. 4 – Dahlia. I adore Dahlias. The more flamboyant and day-glo the better. For the bees, however, we need less flamboyance and single varieties instead, such as ‘Bishop of Llandaff’ which is popular and well-established. So, I’ll include a few single varieties in my all-new-and-improved cutting patch on the allotment next year. The good thing about dahlia is that they’re flowering once many other things have gone to seed, so extending the season into early Autumn. 5 – Borage. Borago officianalis. A pretty herb, the petals and young leaves of which can be frozen in ice cubes to serve in summer drinks. A win – win situation, I call that… Just be aware that this can self-seed and get a bit invasive if you don’t keep on top of it. I might grow mine in a separate bed on the allotment. 6 – Harebell. Campanula rotundifolia. This is the wild Harebell, so if I did grow it, I’d have to be sure that I got it from an approved supplier. I love this little wild flower – it’s the perfect example to me of something that might be called a ‘weed’ but is completely beautiful. Also, Plantlife named it the county flower of Yorkshire a while ago, so it seems fitting that I grow it. 7 – Comfrey – I keep this in a pot as it can go a bit mad and over take everything. Comfrey is also called knitbone (something I learned in an old pony book as a child!) – and is used as a herbal remedy for problems with bones, muscles and bruising. It also makes a great, although stinky, high- potash plant food when the leaves are infused in a bucket of water. Again, a plant that benefits me alongside the pollinators. 8 – Mint. I really recommend Mentha piperita ‘Black Peppermint’, it has a strong, quite powerful fragrance and taste, making it perfect for tearing up in a mug with hot water for peppermint tea. Far better than the dried out sachets you can buy. Mint can also be invasive, but if you keep it alone, don’t put it in too small a pot, it’ll just be unhappy. Give it plenty of room. 10 – Jasmine. Jasminum officinale We have a giant plant of this outside the front of our house and it smells incredible – I’ve already told you how I bring it into the house. The bees love it too. They must be as attracted to the fragrance as I am. So, there we have it. My list of ten plants I will be growing to attract the bees – as well as use as cutting flowers or for eating! It’s important to choose the right plant for the right place, considering your soil type and the exposure to the wind, for example. 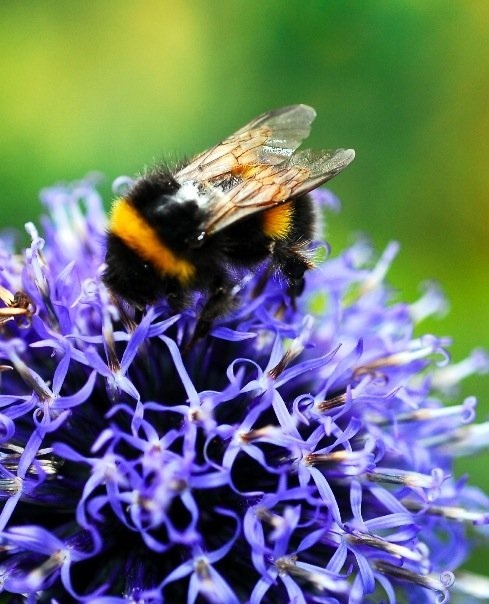 The Royal Horticultural Society have a big list of both cultivated varieties and wild flowers that will attract pollinators, so do go to their website and have a look. I’ve just realised that this blog has got very gardening-heavy recently. I will blog about different things soon, I promise!